This year, I’ve done a lot of cycling race compared to running but nothing to be proud of my cycling. The improvements are not much compared to my running. To improve in cycling, need to invest alot in TIME. Spend more time on the saddle paddling 3 to 5 hours will surely improve the endurance and speed. Spend more on the MONEY will get the best bike gear but not yet guaranteeeeeed to be faster. 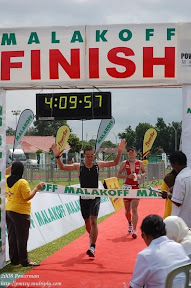 If the activities need to be scale down, then after AVIVA, it is Powerman Malaysia and Miri Triathlon. For local events, Iess bicycle, more on running since cycling need a lot of time to train. Honestly saying, bicycle race is very hard compared to running. First I’m a runner, then a cyclist = Triathlete.